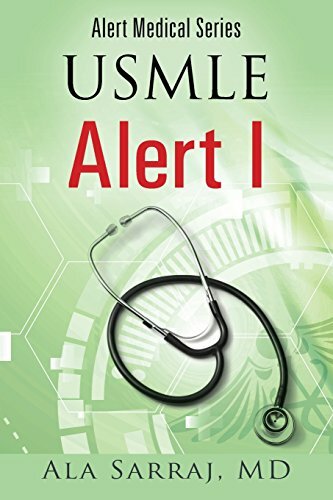 “USMLE Alert 1” by Ala Sarraj, MD, is one of many books in a series that tries to prepare medical students and physicians alike for the rigors of US Medical Licensing Exams (USMLE). To this end, Dr. Ala Sarraj presents from front to back, a list of detailed, concise, and seemingly randomized facts to mimic the format of how questions are commonly ordered on the USMLE. The author’s purpose and intent is for the reader to study the facts in cue card fashion, increasing one’s overall body of knowledge while, simultaneously, strengthening information recall. From the very first glance, it is easy to be skeptical of the series. Dr. Ala Sarraj does not hide his claim that readers are “guaranteed” a “high score passing rate” by reading his book. To the contrary, the front cover and preface read like a late-night infomercial, emphasizing descriptive terms like “a compilation of powerful high yield random notes” and “[we] will guarantee laser-sharp compressive… knowledge acquisition.” In my opinion, regardless of the obvious verbosity, Dr. Sarraj does try diligently to back up these claims with a wealth of information that is undoubtedly collected from years of experience as a physician. The preface seems choppy with several grammatical missteps that seem to suggest that the text was translated into English from its original linguistic narrative. One sentence in particular had been corrected from the preface when quoted on the back cover, which seems to imply the preface was an afterthought. The book definitely reads less like a study preparation guide and more like a collection of notes taken from a variety of classes throughout the author’s tenure, which I found both confusing and refreshing. I found these confusing because my mind immediately wanted the notes categorized or structured in some way. Refreshing because my mind enjoyed jumping through the entire body of medical knowledge I had studied. Even though the author states upfront that this book is a collection of “random notes,” it took me a while to understand the author’s pace. After several reads, I conclude that the value of this text can easily be found in its ability to supplement existing study materials, not replace them. In short, I both respect and appreciate the body of knowledge that “USMLE Alert 1” by Ala Sarraj, MD represents. I also enjoyed reading through the pages and finding myself recalling large swaths of knowledge I had almost forgotten. On the other hand, I feel like the editors of this book need to spend more time thinking through format from the perspective of the learner. I would expect the next version to have a reference index to find specific information and to be a bit more polished in its presentation.